Tools are great. Duh. They help you get the job done. But, my problem with writing tools, is that it can be really easy for some of them to get in the way of the thing they're supposed to help you do. What's that, you ask? The writing. There's a balance needed between features and functionality. While things like Scrivener can be great, sometimes they present too many options, or additional complications because of all their extra bells and whistles. I stopped using Scrivener because it was NOT good at syncing with Google Drive / One Drive--being that the projects are lots of tiny files inside of one folder, it took FOREVER AND A HALF to sync. Oh, and exporting was a nightmare--for me personally--in Scrivener. I DON'T GIVE A SAD SAMMY WHO LOST HIS BALLOON AT THE CARNIVAL about being able to export my manuscript TEN INTERGALACTIC WAYS. That may be fine and dandy for some, especially the self-pub crowd or people who want to write in CHILLER but print in COMIC SANS. But, being an ex-IT guy, I HATE technology. Or at least I hate fiddling with it. I like my stuff to work and work immediately after I open it. K.I.S.S is my motto: Keep It Simple SAMMY, Loser of Balloons in the Land of Carnival. Now, if Scrivener works for you and does not take away from the actual act of writing--that's great. USE IT. Not every hammer was meant to pound your nails... Yeesh, that sounded off. Um, not every drill was meant to... No, that's not much better... You get the point. Everyone fights their own monsters, but not everyone is adept with a long sword. Some people need a war hammer. Others, a bow. Find your weapon of choice and level-up with it. Here are my weapons. I like to use the word weapons instead of tools, because... well, why not? Hopefully my arsenal can inspire your own. Unmatched spelling and grammar check functionality--IMPOSSIBLE to beat when paired with the ProWritingAid add-on. It's fast--or fast enough--if you're working with decent hardware. Google Docs takes way too long to load docs of 100k words or so. ***BUT BUT BUT: It is SUPER nice to know that if you upload things to your Google Drive account and convert them to the Google Docs format, it takes up NO SPACE in your Google Drive. This makes Google Drive GREAT for backups. *** Sure Scrivener may be faster at loading... but Word's vastly superior spell/grammar check and many other features outweigh this. Using headings properly will act almost exactly like Scrivener's 'folders' and 'scenes'. Word file formats are both versatile and the industry standard. Again, Microsoft. It's part of my ecosystem and syncs with all my devices. I love the 'Notebook' approach with tabs and nested pages. This is how I think. It does doodles, voice, and pictures as well. How many things are FREE these days? Not many, so get at it. I always keep a physical notebook or sticky notes handy as well. But my cell phone with the OneNote app is almost always present and even has a cool 'make a quick note' widget. Widgets are still a thing, right? But yeah, I'm of that generation who apparently is not capable of putting down our phones and SECRETLY WISHES THE DARK VOID OF THE SOULLESS INTERNET WOULD ABSORB US INTO ITS BEING. Desk space with cheap standing desk solution. I'll always miss you, my little writing buddy. SimpleMind Mind Mapping tool for both Windows and Android. Mind maps are AWESOME for brainstorming because you can literally SEE and RECORD your thought process. The visual element--for me--helps me ask better questions of my ideas, and thus develops them far better than if I were to try keeping all the chains of thought in my noggin. It easily syncs between android and windows when connected to a cloud service. IMPORTANT: This software is a one-time purchase software. Buy it once ($30ish for PC/Mac & $8ish for Android) and you own it FOREVER. That's almost like free in today's software subscription world. In the past, I used a spread sheet in conjunction with a 'points on a map' outline. Here's a link to author Brandon Sanderson talking in-depth about his outlining process--which I find, more or less, works very well for my brain--here. I would normally pair this with something more visual, like a drawn timeline or arc. For a long time, I longed for a simple piece of software that would help me plot visually, and then easily translate into a 'points on a map' list I could print out and follow while writing. For the longest time all the plotting tools out there have been WAY too complex. Aeon Timeline is great--at timelines--but not the most excellent at visualizing individual plot threads. Scrivener by itself, doesn't do well outside of letting you make a list on steroids. I've been wanting a specific tool, in the sense that it visually outlines, in a powerful and simple way, while letting me keep track of characters, places, and other tags. And when I don't want it to be visual, I need it to give me that 'points on a map' list view. Well, Facebook targeted ads actually did something good for once. I found the perfect tool, and if you're like me, it may be perfect for you too. It's called Plottr. From www.plotmynovel.com. 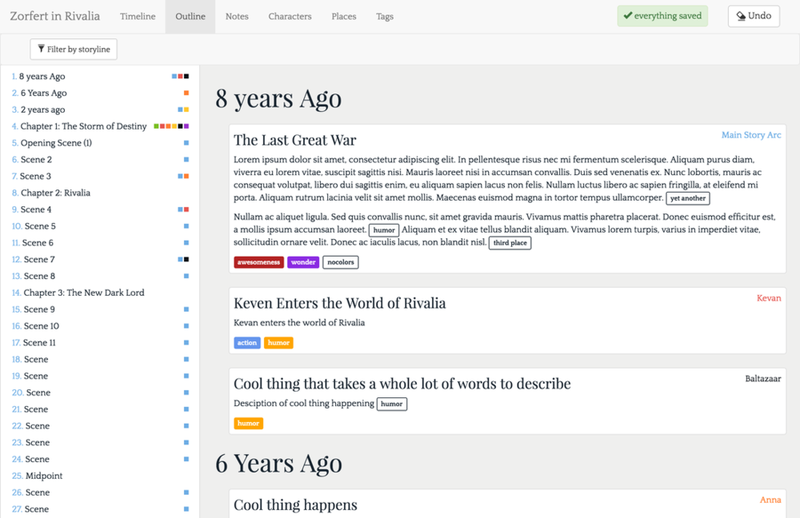 It let's you visually plot, using multiple plot thread timelines, so you can see how they line up side by side. Cards are placed on the timeline, and allow you to put in as much or as little information as you need. There's an outline section that works like a 'points on a map' outline. There's an export feature to export to a map outline .docx file with everything neatly formatted with collapsible headers. There's a place to keep track of notes, characters, places, and custom made tags. 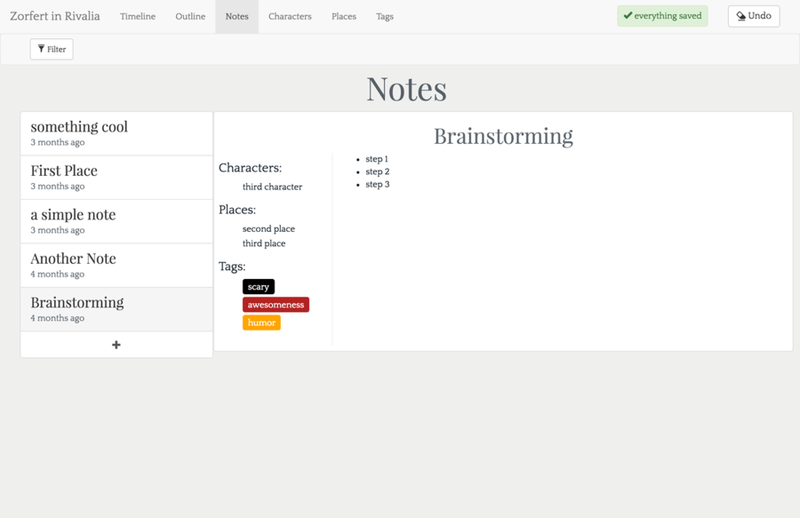 You can tag characters, places, or other custom tags within any card on any plot thread. Sorting with tags is AWESOME. You can flip the plot threads/timelines horizontal or parallel. Want to plot by chapter? You can. By scene? You can. By each individual waking second? You could, although that might be time consuming. Now, keep in mind this software is still a baby--pretty new to the world, and has a bug here or there. For example, until it gets an update--which I am told is coming very soon--it doesn't respond well to having it's files moved around a bunch or renamed. But, there's a quick fix, it generally isn't an issue, and the Developer is super responsive. That said, even though it's new, it's worth the price. A one time buy of $24.95 as of this post gets you Plottr for life. That's a fine price for actually owning the product as opposed to subscription for some dinky online software you'll need internet access for. Simply put, Plottr does what other software can't seem to do these days. Keep it simple. Its handful of features are powerful, and its focus on these simple ideas is what makes it such a wonderful tool. It's visual at the same time that it is practical. The intertwining of visual plot threads and a road map list are pure gold in my book. 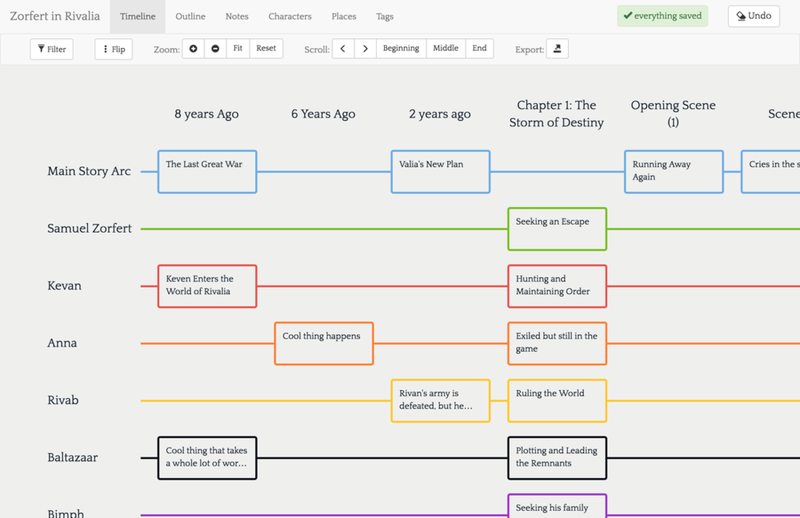 And with tags weaving your characters, places, and other things into the timeline... I love it. I highly recommend it. I liked the software so much in fact, that I chatted with the developer--who you should know went to a certain Utah college and studied writing under a certain famous fantasy author who was mentioned in this post--and he got me an affiliate link. So, if you enjoy my blog, or the Story Goggles Podcast I do with my great friend, Blake, you can buy Plottr through this link. It gives us a kickback of the sale and helps buy our coffee so we can keep creating for you! I hope you found this rambling helpful in some way! What tools do you use? Any recommendations for me? Let me know! There's a comment section below! You can follow me by clicking on the 'F', the bird, or the camera lens at the top or bottom of the page.